Is the Samsung Transform another Galaxy S phone for Sprint? On the first day of this month, we reported about a phone called the Samsung Transform. Based on the name of the device, we let our imagination run wild about a form shifting unit that would take the LG Versa and go beyond that handset's modular design. Based on a picture showing some of the carrier's upcoming models, it looks like we could have been misled by the name of the phone. Looking at the unit, it resembles the Epic 4G. 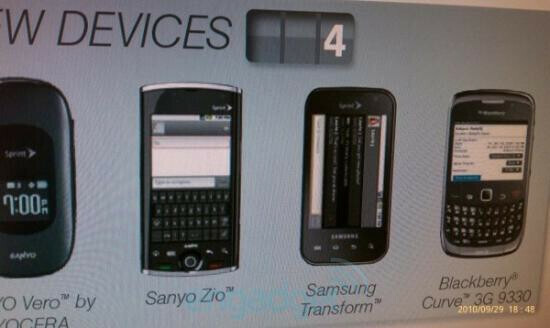 Considering that the latter model is Sprint's variant of the Samsung Galaxy S Pro which includes a slideout landscape QWERTY keyboard, it is possible that the Transform is a version of the plain 'ole Galaxy S without the QWERTY. Whatever the Samsung Transform is, it is clear that the nation's third largest carrier will be at least one of the places it will call home. It's for Sprint not tmob. Ha all those phones are sprint phones... Wow looks like Phonearena dropped the ball big time on this one! To answer this article, no. The Samsung Transform is not another Galaxy S phone for T-Mobile. The Samsung Transform is clearly another Galaxy S phone for Sprint. I could've swore that when I clicked on this it said "...for T-mobile" Well I just googled this phone and it seems to be a non-4g galaxy s pro for Sprint and might actually be the moment 2 and a major upgrade to the intercept. You mean a phone for those who don't want to subsidize Sprint's virtual 4G network (aka those who don't live in an area scheduled for 4G)? I wish they had kept the 5MP camera of the Epic. The Epic's camera is sweet. This sucker better have Android 2.2 out the gate!! None of this "2.1 with an update to be coming shortly crap". My two cents. :-) 4G is not a priority for me and I appreciate that a phone like this will give me some options instead of paying an extra $10 a month.